Jumping burns calories and protects your hips. Your hips might be a trouble spot, but did you know that keeping them healthy with exercise is important for more than just weight control? Weight-bearing exercise helps keep bones and muscles healthy, while staving off several health problems as you age. Jumping is a good form of weight-bearing exercise that can be done alone or in conjunction with other types of exercise. Jumping and other types of weight-bearing exercise build stronger, denser hip bones, which help you maintain density as you get older, according to The University of Arizona. This helps prevent the development of osteoporosis, which is more prevalent in females than males. This type of exercise works because your body fights gravity throughout. The consistent force placed on your hip bones helps keep them strong and healthy by preventing bone loss from lack of use. Jumping is a good option because you don't need special equipment and you can do it virtually anywhere. 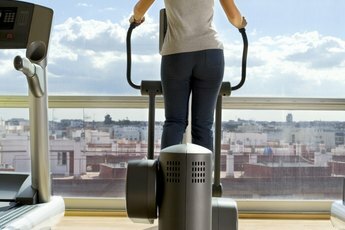 You could just jump up and down throughout your workout several times per week, but it might get monotonous over time. Mixing up workouts that include jumping keeps you motivated, challenges your hips in different ways and increases the likelihood that you'll stick with your program. Jumping rope, playing basketball, doing jumping jacks and dancing are types of exercise that include some amount of jumping. Mix and match your favorites for the most hip benefits. You don't have to jump continuously for the weight-bearing benefits. Combine jumping with other types of weight-bearing exercise to create a more well-rounded workout routine. The National Osteoporosis Foundation recommends 30 minutes of weight-bearing exercise most days of the week. Jumping benefits your hip bones, but might be hard to keep up for an entire half-hour. Mix jumps with walking, jogging or hiking if you can't make it for 30 minutes. These other forms of weight-bearing exercise are beneficial for your hips and are easier to sustain. Despite the hip bone benefits of jumping, certain safety precautions help maximize the workout and prevent injuries. Varying your workout prevents overuse injuries and shock-absorbing shoes lessen the impact to your hips when you land. Pain while jumping may indicate a problem. Stop jumping to prevent an injury. If you already suffer from osteoporosis or other bone disorders, contact your doctor before adding jumping to your routine. 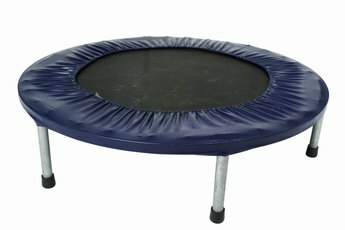 Does Rebounding on the Trampoline Give a Good Cardiovascular Workout?